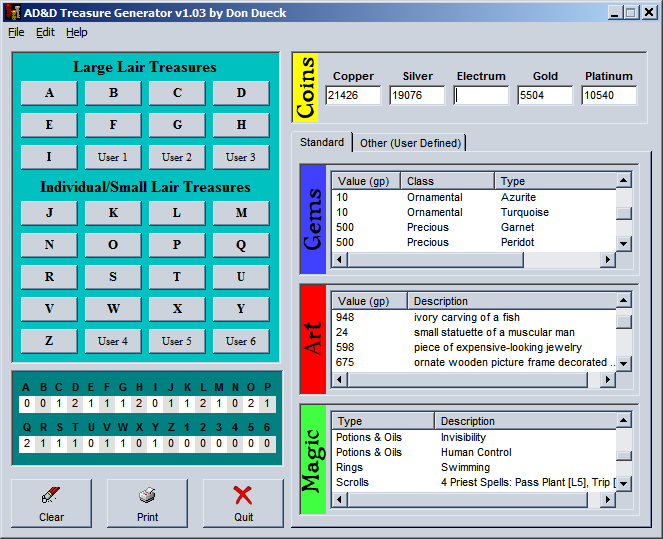 Here’s a little random treasure generator program I made for use with the second edition Advanced Dungeons & Dragons rules. Someone requested I make it available again, so here it is. I wrote this in 1999 in Visual Basic 5. It covers all the treasure types in the game (except intelligent weapons) plus it allows for the modification of treasure types and adds support for custom treasure types. 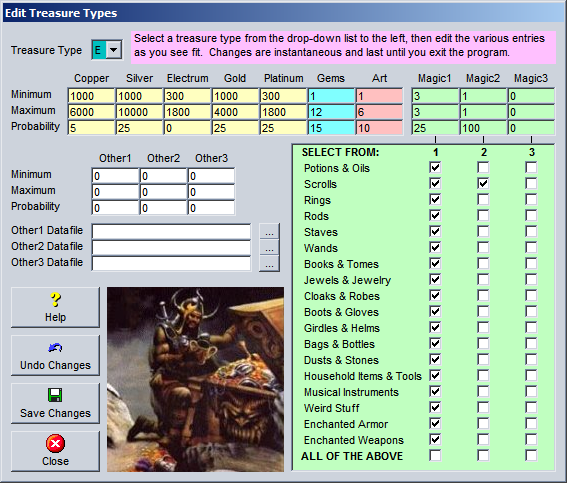 I guess with a little editing of the treasure types you could make this program useful for pretty much any edition of D&D. The program still works just fine in Windows 7 64-bit. I’ve included the entire Visual Basic 5 source code in src.zip. Do with this what you will. It’s possible I may have missed a system file or two, but you should be able to find them online, if this is the case, as the program will tell you which files are missing. And, no, I will not make changes to this program for you. The source code is provided, so either learn how to change it yourself or ask someone else to do it for you. This entry was posted in All Things Don, Dungeons & Dragons, Games, Roleplaying Games and tagged AD&D, advanced, D&D, dragons, dungeons, generator, random, treasure. Bookmark the permalink. Odd. I just downloaded the zip file to check and it *does* have the msvbvm50.dll file in it. Excellent little program. Thank you! excellent. love 2nd ed. only. love the program. do you got one with a random monster generator 2nd ed. Seems to be that dropbox doe snot host the file anymore. Is there any other location to get the treasure generator? Thanks! I’ve fixed the broken download link now. Strange. The links works fine for me (even without me being logged into Dropbox). You’ll probably have to “register” the file with Windows. I attempted to register the file with windows using that article you provided, but it tells me that the module cannot be found… is there any specific place on the computer that you should place the program?